Since the inception of my teaching career, I have had the aspiration to empower learners with an awareness of the universe and its all-encompassing magnitude. My interest in our universe originally began when my optical telescope was damaged and whilst perusing the internet for a replacement, I came across an article pertaining to radio telescopes. As a school boy, I always had an interest in building radios and on finding the appealing article, decided to combine both interests in astronomy and the use of a radio. Whilst Deputy Principal at Merryvale School, I identified an opportunity to implement my passion in exposing our learners to this wonderful and to them, unknown realm. What makes it more special is the fact that we accommodate very high needs learners at our school, who are seldom, if ever, exposed to any information other than that pertaining to their immediate environment. My focus, in the introduction of this information to our learners, is not necessarily just on the obtaining of scientific data, but on cultivating an interest in the field through experience and exposure. As we progress, we hope to encourage other learners to become involved in this worthwhile and exciting project. We are considering approaching another school, one which also caters for physically disabled learners, so that they can also get to appreciate this wonderful exposure to the outer skies. I would like to make use of this opportunity to thank those who assisted me and thereby further inspired my passion. These special individuals include Wanda Diaz, Victor Herrero, Jim Sky, and Wes Greenman. A huge thank you to Ron Sindric who kindly sponsored the delivery of the calibrator for our school. Words of appreciation and our heartfelt thanks also need to go to SARA (Society of Amateur Radio Astronomers) who financed the shipping of the calibrator to South Africa. Your kindness is greatly appreciated. As a token of our deepest appreciation and upon receiving his permission, we would like to name the venue housing the equipment the ‘Ron Sindric Astronomy Room'. 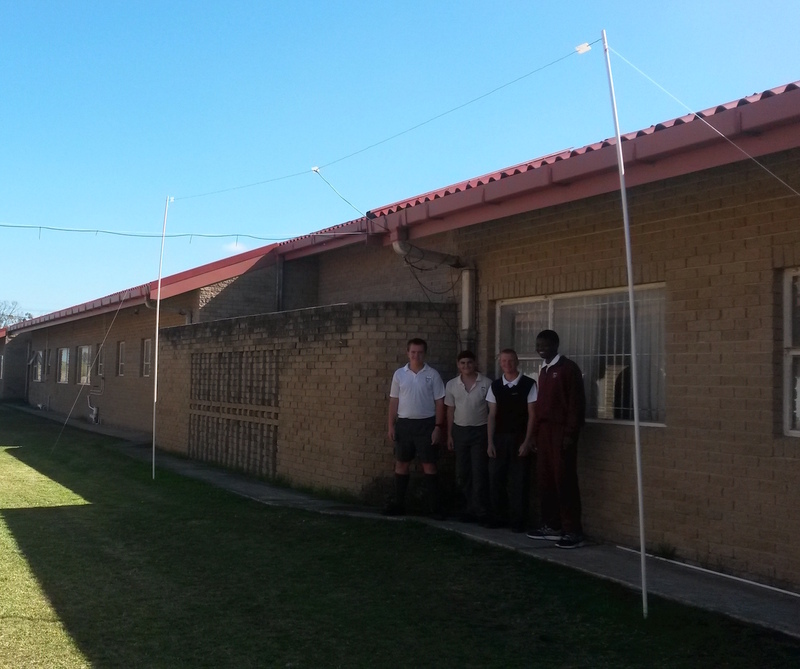 (top image) Students of Merryvale School with their Radio Jove dipole and (bottom image) with the author and their receiver system. 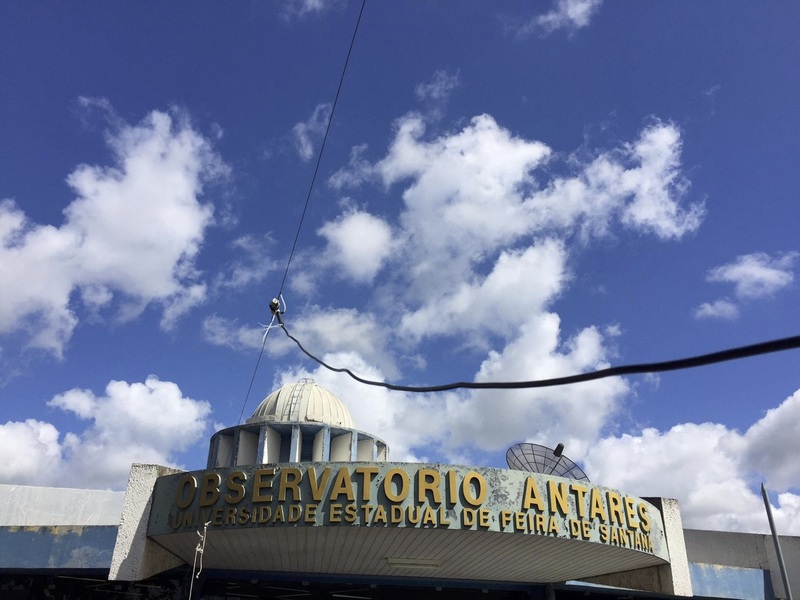 On 09 and 10 June, I was one of the speakers of the X Course of Astronomy at the Antares Observatory, presenting a workshop on Radio Jove, in Feira de Santana, Bahia, Brazil. I referenced Radio Jove in my dissertation entitled "Experimental Radio Telescopes for Teaching Astronomy in High School". My advisers are Germano P. Guedes and Marildo G. Pereira. This dissertation was for completion of the Professional Masters in Astronomy at UEFS (Universidade Estadual de Feira de Santana). 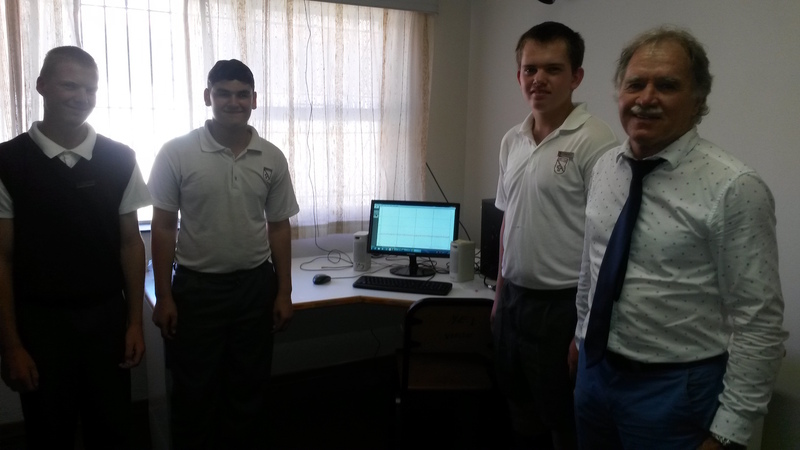 The workshop was a great opportunity to talk about radio astronomy to a diverse audience. The receiver was installed with just one antenna, for demonstration, taking advantage of the structure of the building. 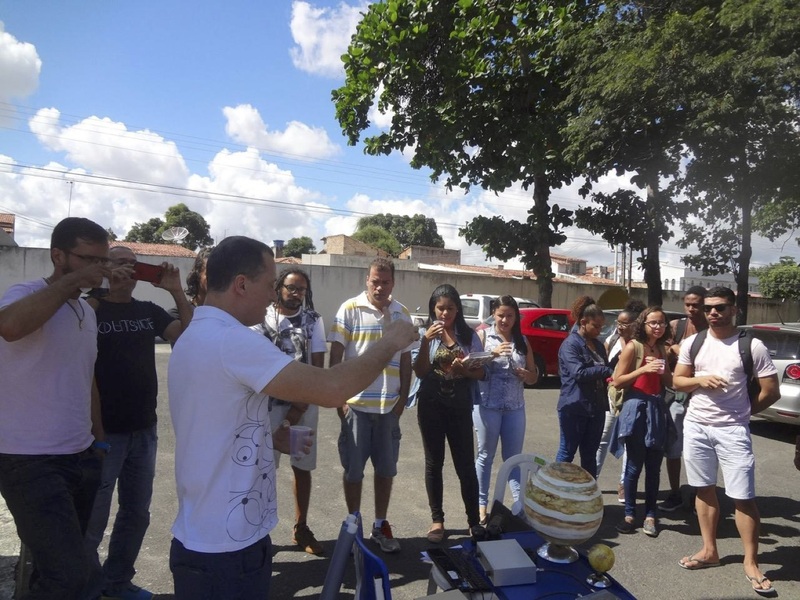 (top image) A Radio Jove dipole at the Observatorio Antares in Bahia, Brazil and (bottom image) the author presenting the Radio Jove system to participants at the Astronomy Workshop. Photos by José Carlos S. Santos. 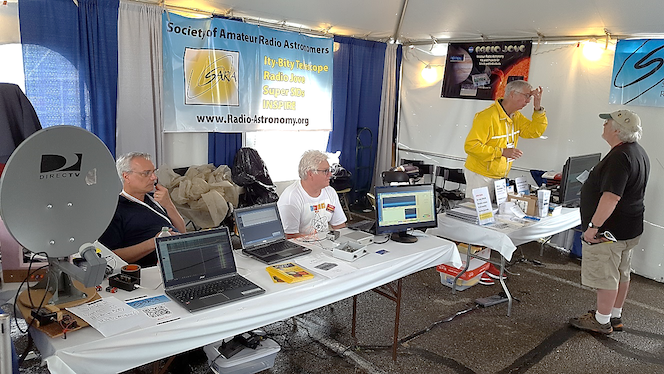 Radio Jove and the Society of Amateur Radio Astronomers (SARA) attended the Hamvention in Dayton, Ohio on May 18-21, 2017. Radio Jove was represented by Jim Sky (center) and Chuck Higgins (behind the camera) while SARA was represented by Tom Hagen (left), William Dean (right), and Ken Redcap (not pictured). Based on brochure distribution, more than 500 people came by to learn about our various radio astronomy projects for science and education. Besides the rainy conditions and muddy parking lots, the event was a reasonably good success. Bill Dean (right) discusses Radio Jove and SARA projects with a Hamvention attendee. Tom Hagen and Jim Sky are ready with satellite TV, VLF, and HF demonstrations. The Society of Amateur Radio Astronomers (SARA) annual meeting is coming this Summer at the National Radio Astronomy Observatory (NRAO) in Green Bank, WV. The meeting will take place from Sunday evening July 23 through the morning of Wednesday, July 26, 2017. SARA members and guests give presentations on Monday and Tuesday, and attendees have the option of taking a High Tech tour of the NRAO facility. The keynote speaker is Dale Gary, Distinguished Professor in Physics at the New Jersey Institute of Technology (NJIT). His presentation is titled: “Observing the Radio Sun Across Seven Decades (200 kHz to 200 GHz and 70 years)”. Radio Jove members Jim Brown and Chuck Higgins will be giving talks about new low frequency antennas and the solar eclipse observing plans for Radio Jove, respectively. Radio Jove participants are welcome to attend, but if you cannot come this year SARA will live stream the conference presentations. Also, a CD of the conference proceedings will be for sale for $15.00 from the SARA website. Registration and meeting details may be found on the SARA website: http://www.radio-astronomy.org Late registration is still available after May 31. We hope to see you there. [Editors Note: Jim Brown has provided a series of data files and images to illustrate, using built-in options of the Radio Sky-Pipe software, methods of smoothing Galactic background scans without losing the important background level. These images and the Radio-SkyPipe files of the 2017 February 15th Galactic Background are all available on the Jove Archive. 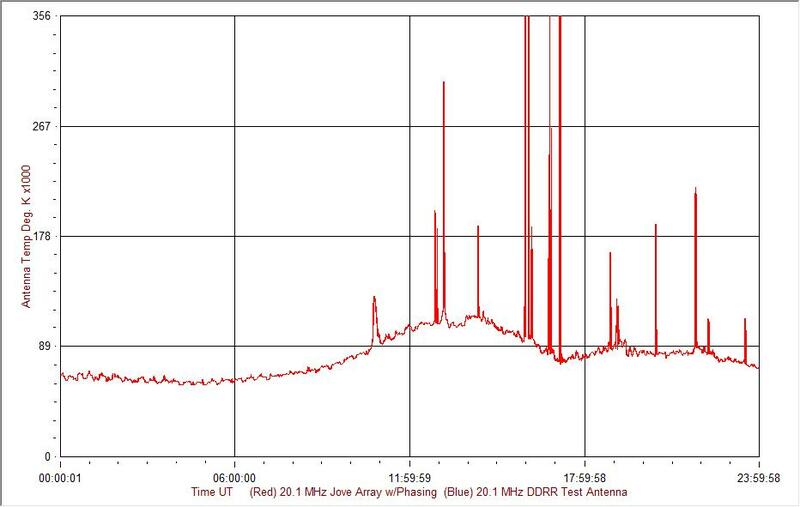 Note that the images only display data from the Radio Jove dipole array, the blue trace mentioned in the figure was not shown for the sake of clarity. Figure 1. This is the raw data from the 24-hour run on February 15, 2017. 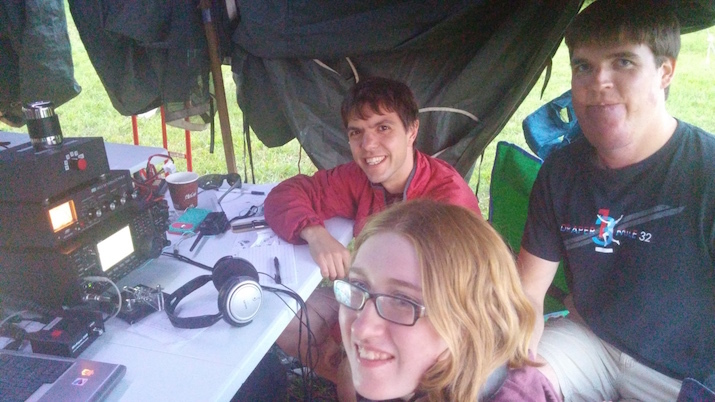 While RadioJove participants primarily listen at 20.1 MHz in order to study the Sun, Jupiter, the Galactic Background, and Earth's ionosphere, licensed amateur (ham) radio operators actively transmit on designated frequencies between 1.8 - 30 MHz in order to communicate over long distances by refracting signals off of the ionosphere. The ionosphere is primarily generated by photoionization of the Earth's neutral atmosphere due to ultraviolet energy from the sun, and space weather events can have a substantial effect on these communications. Recently, amateur initiated-and-run projects such as the Reverse Beacon Network, PSKReporter, and WSPRNet have allowed the real-time monitoring of these communications and propagation paths. While these projects were created purely for amateur radio purposes, they have produced large datasets that have the potential to be used for space weather and space science research. The availability of these citizen science datasets led to the creation of HamSCI, the Ham Radio Science Citizen Investigation, a citizen science organization that works to connect the amateur radio and professional research communities. HamSCI has three objectives. First, to advance scientific research and understanding through amateur radio activities. Second, to encourage the development of new technologies to support this research. Finally, to provide educational opportunities for the amateur community and the general public. Amateur radio transmissions are the source of all ionospheric data generated for HamSCI. These transmissions are generated by stations that range from simple to very complex. A modest station will often include a 100 Watt HF transmitter, a wire antenna, and a computer. These systems are capable of communicating using voice/phone (single side band/SSB), Morse code (continuous wave/CW), and digital modes (Phase Shift Keying 31 Hz/PSK31 and Radio Teletype/RTTY). Figure 1 shows an example portable station used during the popular ARRL Field Day operating event. Figure 1.Nathaniel Frissell, W2NAF, Magda Moses, KM4EGE, and Andrew Kriz, KK4APR, operate a portable HF ham radio station. Stations like this can generate signals that can be used to remotely sense the ionosphere. The signals generated by these stations are monitored by a variety of listening networks. Morse code (CW) and RTTY transmissions will be detected by the Reverse Beacon Network (RBN), while PSK31 and other digital transmissions will be detected by PSKReporter. Each of these networks record the call signs of both the transmitter and receiver, the time and frequency of the observation, as well as a signal-to-noise ratio (SNR) measurement that characterizes the strength of the received signal. Both the RBN and PSKReporter require no special intervention from the communicating amateurs; these systems will automatically detect, report, and log routine communications. 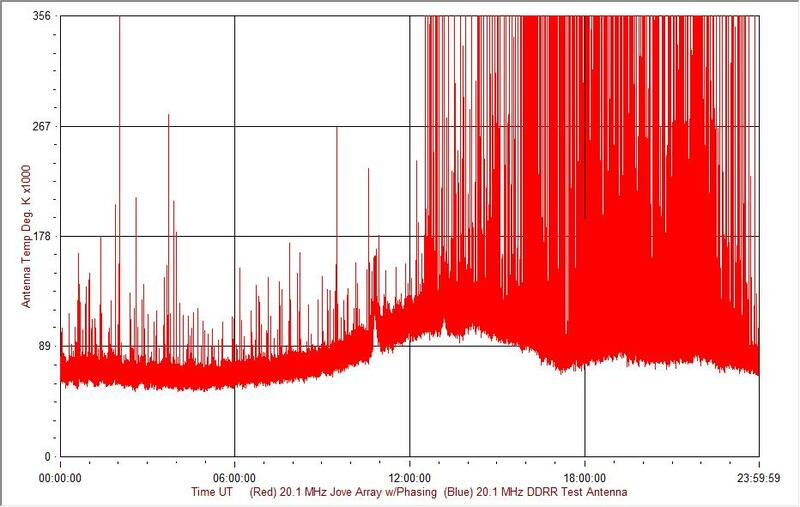 A third radio reporting network, the Weak Signal Propagation Reporting Network (WSPRNet), is more specifically designed for finding unusual ionospheric propagation paths. This is an all-digital mode designed by Joe Taylor, K1JT that permits only a limited exchange of 2-way information over a long time period. In doing so, it is able to detect propagation paths that would not normally be found by other modes. An example of how solar flare effects may be observed in Reverse Beacon Network data is available in a Frissell et al. Space Weather Journal feature article. On August 21, 2017, a total solar eclipse will cause the shadow of the moon to traverse the continental United States from Oregon to South Carolina in just over 90 minutes. While solar eclipses are perhaps best known for their stunning visual display, the shadow of an eclipse also causes changes to the ionosphere. While these effects have been studied for over 50 years, it is still unclear how much of the ionosphere is affected and for how long. This is largely due to the fact that total eclipses are relatively rare events and only in recent years has the technology existed to "image" the ionosphere over large geographic areas. A team of researchers at Virginia Tech and supported by researchers at the New Jersey Institute of Technology are planning experiments to address these questions. Many of these experiments include traditional space physics instrumentation, such as SuperDARN radars, GPS Total Electron Content Receivers (GPS-TEC), ionosondes, and numerical models. However, they are also working to engage the amateur radio community to participate in a Solar Eclipse QSO Party (SEQP) to illuminate the ionosphere on the ham radio bands and generate data through the RBN, PSKReporter, WSPRNet, and user-submitted logs. A QSO Party is a contest-like event that encourages ham radio operators to make many contacts during a designated period of time in order to earn points. "QSO" is a ham radio term for a contact or communication. Points are earned for every contact made. Multipliers and bonuses are given to encourage specific operating behaviors. By appropriately defining the rules, it is possible to turn the QSO Party into a scientific experiment. In this case, the SEQP rules are defined to encourage repeated contacts on HF amateur radio bands across the continental United States before, during and after the eclipse. The rules also include incentives for radio operators to use modes that will be automatically observed by the RBN and PSKReporter, field RBN and PSKReporter Nodes, and operate outside so that they may also visually enjoy the eclipse. Previous experiments show that the eclipse will have a dramatic effect on the ionosphere. This is shown in Figure 2, which shows the F2 region peak critical frequency (foF2) over Chilton, England during a total solar eclipse on 11 August 1999 (Figure 2b). The green line in Figure 2 shows measurements made with an ionosonde [Afraimovich et al., 2002], while the blue line shows the expected (non-eclipsed) values generated by the International Reference Ionosphere (IRI) model [Bilitza et al., 2011]. The measured values depart from the expected values from 0800 to 1200 UT, much longer than the less than 10 minutes of totality. 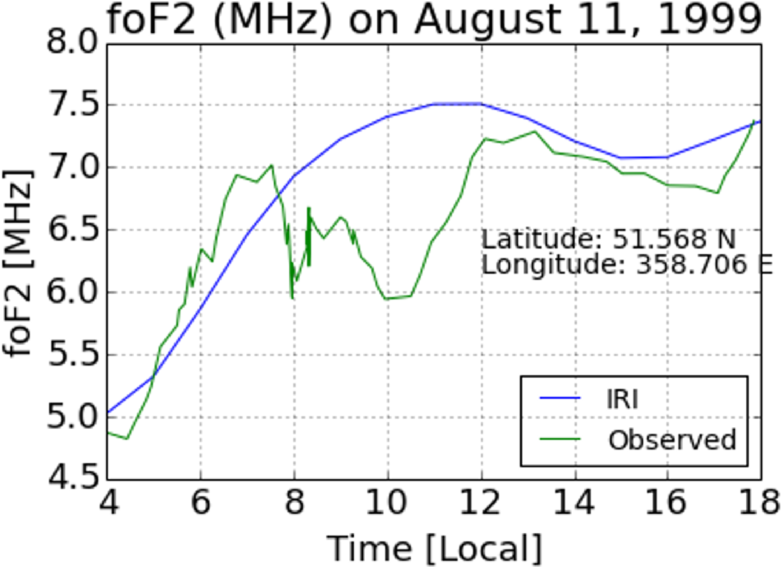 There is a 1.5 MHz difference between the observed eclipsed and the modeled non-eclipsed foF2 values. Figure 2.:Effect of the August 11, 1999 eclipse on foF2. The decrease in the observed foF2 (green) from the IRI model (blue) over a long period coincides with partial obscuration of the solar disk. Figure by M. Moses, KM4EGE, Virginia Tech. Time in Universal Time, UT, the maximum eclipse was at 10:18 UT. Figure 2b. 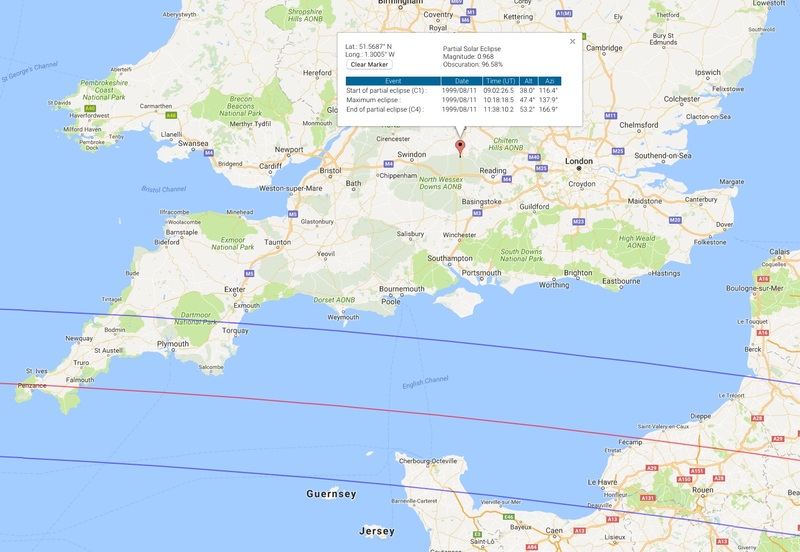 : Map of the August 11, 1999 eclipse with a marker at Chilton, England with circumstances of the eclipse. The center of the path of totality is indicated by the red curve. Map courtesy of the NASA Eclipse Web Site. The expected decrease in ionosphere foF2 due to the solar eclipse should affect amateur radio operations. 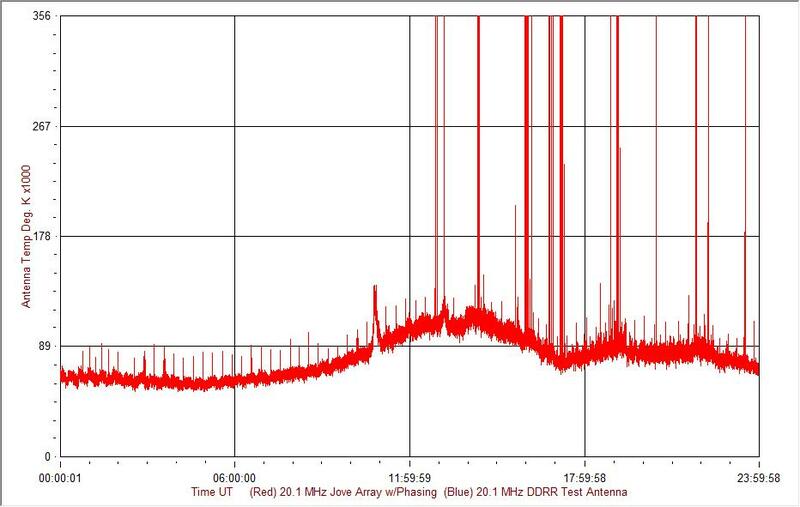 By looking at previous amateur radio contest data and the effects of the dawn terminator, it is possible to get an idea of how the solar eclipse might affect ham radio data during the SEQP. Figure 3 shows a map of Reverse Beacon Network-derived foF2 values in the continental United States during a 15 minute period at dawn during the 2014 ARRL CW November Sweepstakes, a popular contest aimed at promoting Morse code (CW) operations within the United States and Canada. The map includes data from 732 transmitters and 98 RBN receivers. foF2 values were derived from the RBN data using an experimental algorithm [Miller et al., 2015]. It can be seen that the lower values of foF2 observed in the western U.S. transition smoothly to higher values of foF2 in the eastern part of the U.S. This foF2 gradient appropriately points across the dawn terminator, which is indicated by the gray shading behind the foF2 data. 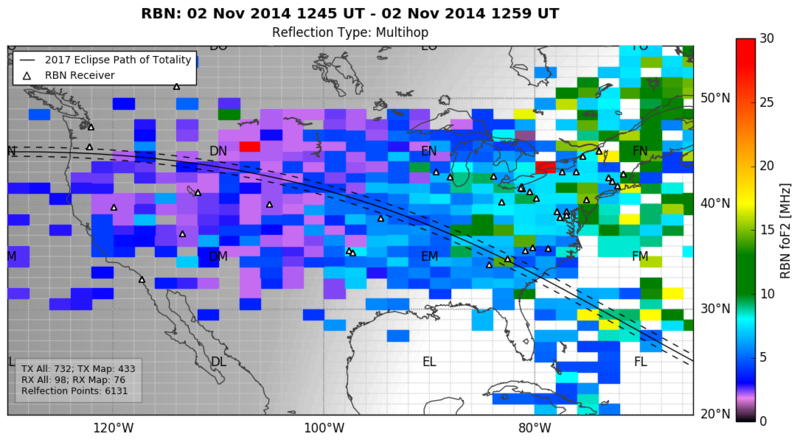 The lower foF2 values on the night side are caused by lower ionospheric densities due to lack of sunlight. The path of totality of the 2017 eclipse is superimposed on Figure 3. This shows that the amateur radio data provides adequate coverage of the region expected to be affected by the eclipse. It is expected that the eclipse will cause foF2 decreases that will be observable in the SEQP data. This will data will be used in conjunction with traditional ionospheric sounding techniques to determine the spatial and temporal extent of solar eclipse ionospheric effects. EclipseMob: A citizen-science project to study eclipse-driven ionospheric effects using the Very Low Frequency (VLF) and Low Frequency (LF) bands led by George Mason University and the University of Massachusetts at Boston. Stratos Project: A high-altitude balloon project run by students at Bob Jones University that will use amateur radio to send eclipse data back to the ground. RadioJove: An organization well-known to the readers of this newsletter. A complete listing of HamSCI eclipse activities may be found at http://hamsci.org/eclipse. Participation in many of the HamSCI activities requires the presence of a licensed amateur radio operator. If you are not already a ham radio operator and would like to become one, there are many resources and testing sites available. A great way to get involved is by joining a local ham radio club, where you can find people who will teach you and give you a personalized introduction to the amateur radio hobby. Afraimovich, E. L., E. A. Kosogorov, and O. S. Lesyuta (2002), Effects of the August 11, 1999 total solar eclipse as deduced from total electron content measurements at the GPS network, J. Atmos. Solar-Terrestrial Phys., 64(18), 1933–1941, doi:10.1016/S1364-6826(02)00221-3. Bilitza, D., L.-A. McKinnell, B. Reinisch, and T. Fuller-Rowell (2011), The international reference ionosphere today and in the future, J. Geod., 85(12), 909–920, doi:10.1007/s00190-010-0427-x. Frissell, N. A., E. S. Miller, S. R. Kaeppler, F. Ceglia, D. Pascoe, N. Sinanis, P. Smith, R. Williams, and A. Shovkoplyas (2014), Ionospheric sounding using real-time amateur radio reporting networks, Sp. Weather, 12(12), 651–656, doi:10.1002/2014SW001132. E. S. Miller, Frissell, N., Kaeppler, S., Demajistre, R., and Knuth, A., The Ionosphere's Pocket Litter: Exploiting Crowd-Sourced Observations, in Fall AGU - Oral Presentation, San Francisco, CA, 2015.